For many composers, issuu is the standard for sharing scores online. Unfortunately, the platform is not very user-friendly, especially when trying to study scores online. One alternative is to display them on your website as PDF files with a watermark, i.e. "FOR PERUSAL USE ONLY." I find this presentation much less distracting than the issuu format, even with the watermark. Here is an example of one these watermarked scores. 1. Download this PNG file which reads "FOR PERUSAL USE ONLY." This will be used later as your watermark. You can alternatively create your own watermark through a program like Pages, Word, or OpenOffice, etc., and export it as a PNG. 2. Open the application, Automator on your OS X. 3. Click the Service icon. 4. 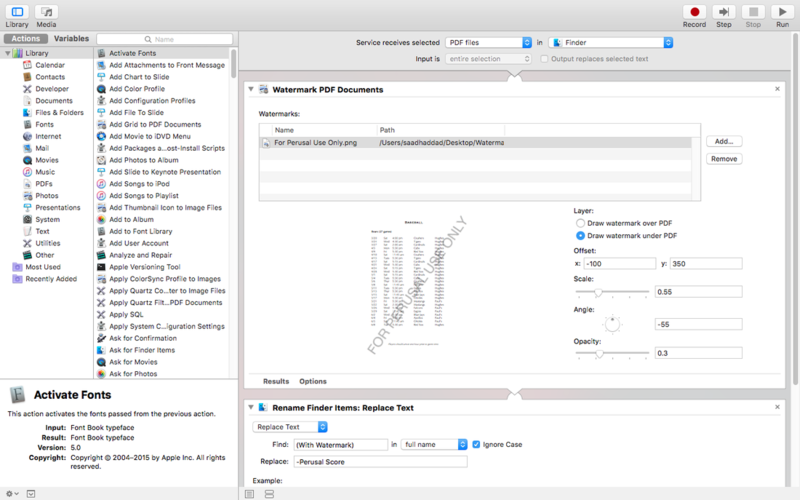 Change the settings to the following: "Service receives selected PDF files in Finder". 5. On the left panel, search for Watermark PDF Documents and double click it. 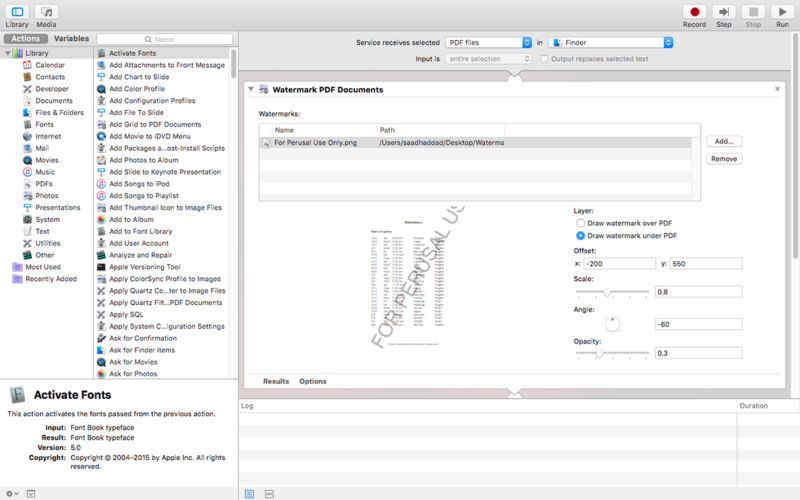 It should now appear in your window under "Service receives selected PDF files in Finder"
6. Click Add to select the PNG file you downloaded in Step 1 or an alternative PNG file. 7. On the left panel, search for Rename Finder Items and double click it. It should now appear in your window under "Watermark PDF Documents." 9. On the left panel, search for Move Finder Items and double click it. It should now appear in your window under "Rename Finder Items: Replace Text." 10. Choose a folder to store your watermarked PDF's or create a new folder. Check Replace existing files. 11. On the left panel, search for Reveal Finder Items and double click it. It should now appear in your window under "Move Finder Items." 12. At this point, make sure File->Save your work. Note that you will have to create a new watermark setting for each size document you use. For the purposes of this demonstration, let's name this Tabloid Watermark. 13. The most common sizes for music in the United States are the Tabloid 11"x17" and Letter 8.5x11" documents. We now need to go back to the "Watermark PDF Documents" on the right panel and fill in the following settings if you are using the PNG file from Step 1. For other PNG files, you will need to experiment with these settings yourself. 14. File->Save again after you have copied these settings. 15. Right click a PDF document that you want watermarked. In the drop-down menu, you will find your new watermark -- make sure to use the setting that corresponds with the size of your document. 16. Go to the watermark-designated folder you created in Step 10. 17. Now you have a newly watermarked score! Go out and celebrate!